A resource to discuss in open peer commentary the Visionary works, of Hildegard von Bingen through her Treatises, Letters, and Lingua Ignota. Visions at the light of the Catholic faith are at the very heart of Hildegard von Bingen’s life and the theme of her literary masterpieces: Liber Scivias and Liber operarum divinarum. In describing these phenomena, always occurred as she wrote, “in the purity of the mind” (Epist. CIIIr), the German doctor of the Church presents a mystic experience much closer to the so called “raptus” than the traditional mystics (“intimate dialogue with the Lords”, Massimo. Bettetini, 2002), experimented for example by Theresa of Avila or Faustina Kowalska or Gemma Galgani. My paper is aimed at exploring the mystic experience of Hildegard in a phenomenological perspective, as an intellectual, conscious intuition without intermediation (similar to the one lived by Saint Paul). This is a premise in order to answer a main question, posed by feminist philosopher Luisa Muraro (“Il Dio delle donne”, 2003): “What did it happened in the XIII century to make mystics change so radically?”. 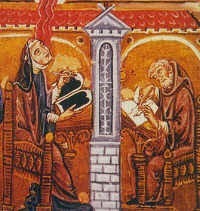 Moving from the experience of Hildegard, who represents perhaps the last great interpreter of the holy “raptus” before the XIII centuries, I’ll argue that the new approach to knowledge developed by the Arab mediation of Aristotle and, particularly by St. Thomas Aquinas changed also the mystics in Western civilization. The idea that knowledge is the result of a mediation between subject and object reflects also in the relation with the Divine. Since XIII century, in fact, visions are not mainly intellectual: St. Catherine of Siena, for instance, sees Christ and the Virgin Mary; in her mystic wedding she receives a ring, something “real” and “concrete”. Among the consequences that follow this epistemological turn, one seems to me of a particular interest for the history of women. Supernatural intuitive visions related to a therapeutic potential will be considered symptoms of possession and pathology. The so called “vetulae” (old women) very well known in the Early European Middle Ages will become socially dangerous subjects and will be said witches. I’ll notice the similarities between Hildegard (said “vetula” by the abate Brauweiler in 1169) and those oldies.